Choosing the right finish for your cast iron radiators is difficult given the wide range of finishes we have. By default all of our cast iron radiators come in factory primer, generally it is not advised to take a radiator in primer. The majority of the cast iron radiators we manufacture are painted at our North Yorkshire factory. Below is our list of historic stock colours, however, we are able to paint a cast iron radiator in any RAL or British Standard colour - talk to us on 01723 321 000 if you want us to match a colour. We can send a sample of any of the below colours - click here to read about painted cast iron radiators. We are able to paint your cast iron radiators in any Farrow and Ball, Sanderson, Laura Ashley, Little Greene, Fired Earth, Ardenbrite or any other Paint you have found and you like. This may take a few days longer if paint needs to be ordered. Talk to us on 01723 321 000 to discuss your requirements. You can read about branded paint on cast iron radiators by clicking here. We stock low VOC water based paint from Fired Earth - note that this may add to painting time. The process of antique washing a cast iron radiator is a popular one that has been used to age cast iron radiators for over a century. Any painted cast iron radiator can be Antique Washed - though generally certain colours such as French Grey work better than darker colours. An Antique wash is where special paint is applied on top of a dry painted cast iron radiator, then 'washed off' as the radiator is drying. This artificially ages the cast iron radiator. 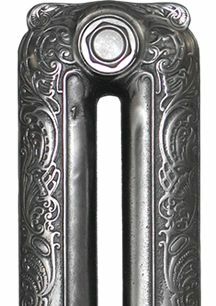 This popular finish only works on decorative cast iron radiators or radiators with an uneven surface. We do not do this finish column radiators or old school radiators as it just doesn't look good on smooth cast iron radiators. The price of Antique Washing Cast Iron Radiators is £7 per section in addition to the cost of the paint you choose. Therefore, if you chose one of our stock colours such as French Grey at £6 per section and wanted this to be antique washed, this would be a further £7 per section or £13 per section in total. To discuss this finish more, please do not hesitate to contact us on 01723 321 000. Popular in mainland Europe, powder coated cast iron radiators provide a durable smooth finish that is easy to wipe clean and retains a smooth and deep colour. 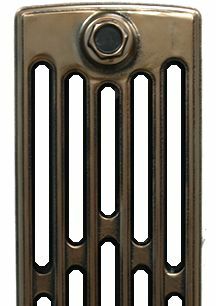 Powder Coating cast iron radiators is a finish that has taken many years to perfect as there is a relationship between the casting, the temperature and the amount of powder coat to obtain a perfect finish. 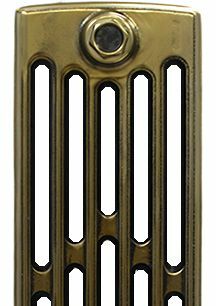 We can powder coat a cast iron radiator in any RAL colour or British Standard colour and we have a range of the most traditional colours used on cast iron radiators - Antique Gold, Antique Silver and Antique Copper. Powder coating takes a little longer to complete than painting as we work with one of the UKs leading powder coating factories in North Yorkshire to deliver this finish. 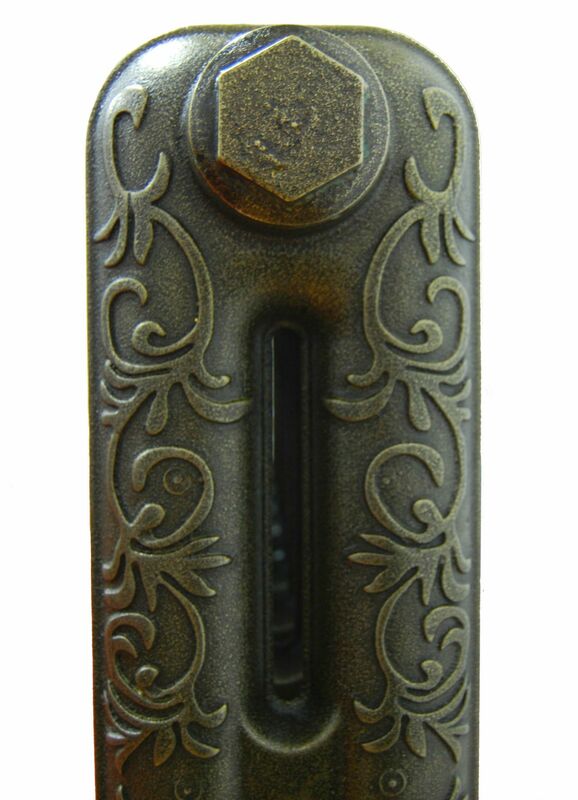 The pricing of this finish is based on the height of the casting. For castings up to 560mm Powder Coating costs £10 per section; cast iron radiators between 561mm and 810mm in height are £14 per section and above this, the cost is £18 per section to powder coat. To read more about powder coating click here or call us on 01723 321 000 to discuss your requirements. Our Cast Iron Radiators probably look their best when polished. This is a very time consuming process where each section is individually polished with a series of up to 12 different grades of bespoke polishing wheels. There is limited polishing capacity for cast iron radiators in the UK, generally polished orders have a lead time of 4 weeks. When choosing a Polished finish there is a three step process. 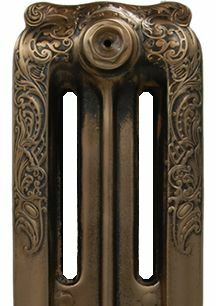 We also offer Machine Polished Cast Iron Radiators (see below) which are different to hand polishing - they are slightly cheaper, but not as smooth as hand polished cast iron radiators. We offer three grades of finish - Traditional polish, Satin polish or Mirror polish. The vast majority of polished cast iron radiators we manufacture are Traditional Polished Cast Iron Radiators at £21 per section. Satin Polish at £19 per section is a polish that is an off shine. The cast iron radiator is polished in exactly the same way as the traditional polish, but the last 2 stages are omitted. Mirror Polish at £25 per section, is a cast iron radiator that goes through three extra stages of polishing and results in a very high shine. Whilst this is a startling finish on an old school cast iron radiator or column radiator, on a decorative cast iron radiator, a mirror polish will have the effect of 'polishing out' the pattern and would be a bad choice. The vast majority of our Polished cast iron radiators are only polished on visible areas only. This would mean polishing the cast iron radiator on the front, the top and on the end sections but not on the back which would be placed against the wall. If a cast iron radiator is placed in the middle of a room or in a conservatory, you should request FULL POLISH. There is a £3 surcharge per section for this requirement - but in the vast majority of situations this is unnecessary. Polished cast iron radiators look great but they can oxidise if they are not kept dry or lightly oiled on at least a monthly basis, ideally on a weekly basis. To avoid this ongoing maintenance, most customers choose to have their polished cast iron radiators lacquered. We have developed a clear lacquer and a patent pending process that will result in your polished cast iron radiators staying the same as they day you first bought them without maintenance. We always recommend that you request your polished cast iron radiators be lacquered at £7 per section. 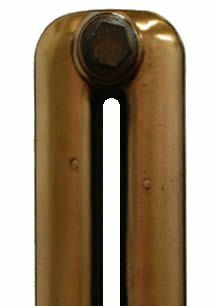 Machine Polished cast iron radiators offers an alternative to hand polishing process. All Machine Polished Cast Iron Radiators are full polished on all sides - but the finish is slightly different. Our machine polishing process is less smooth than a hand polished cast iron radiator and looks slightly different for each casting. Machine polishing burnishes the cast iron radiator to a clear shine, however the sand casting surface is retained - as per the photographs on the right. 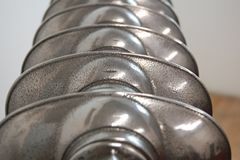 Machine Polishing is an extremely popular finish for cast iron radiators and as a result the lead time does vary dramatically based on how busy our polishing machines are. Our polishing machines run 24 hours a day and 7 days a week, but it does take 12 hours to polish a batch of cast iron radiators. In general, because of its popularity, Machine Polishing has a slightly longer lead time than hand polished cast iron radiators - call us now on 01723 321 000 to confirm today's lead time. 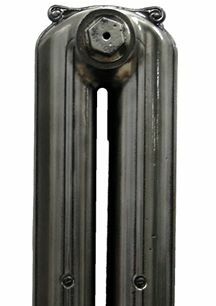 for castings above 801mm - £22 per section. Cast Iron Radiators Ltd have developed a range of incredible finishes. Unique to ourselves, these finishes which have been developed over the last 2 years are designed to emulate metallic finishes. We call this series of finishes - Precious Metals. Each of these special finishes is available for £30 per section. 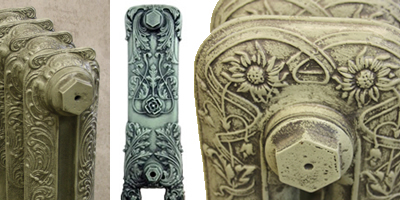 Decorative Cast Iron Radiators look great when highlighted or finger painted. This finish involves painting the cast iron radiator one colour, then finishing the ridges of the cast iron radiator by hand in a complimentary colour. 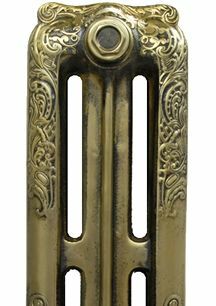 The most popular highlight painted cast iron radiator tends to be either gold or silver highlight on black (as pictured), but this approach can combine any two colours, we have done gold on pink (which we call burlesque cast iron radiators) or gold on cream - which we call gilded porcelain. Naturally this finish only works on cast iron radiators where there is decoration to highlight and is therefore generally limited to our range of decorative cast iron radiators. We have developed a range of unique Special Finishes for Cast Iron Radiators over the last few years which combine specialised paint products with metallic inclusions. These special finishes involve highly specialised paints, etching techniques and processes. 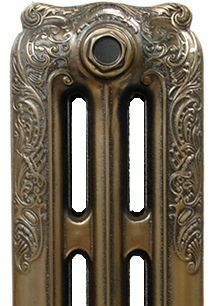 In addition to our unique and comprehensive range of traditional finishes for cast iron radiators, we are able to complete unique commission such as our Rainbow Cast Iron Radiators. A Rainbow Cast Iron Radiator finish can be applied to any casting, this finish involves painting all castings individually and then carefully combining them in a manner that ensures the finished item retains its spectacular look. Rainbow finishes cost £15 per section, but if this gives you inspiration for your cast iron radiator project, please don't hesitate to call us on 01723 321 000 as we would love to hear your ideas. All of the above prices exclude VAT.